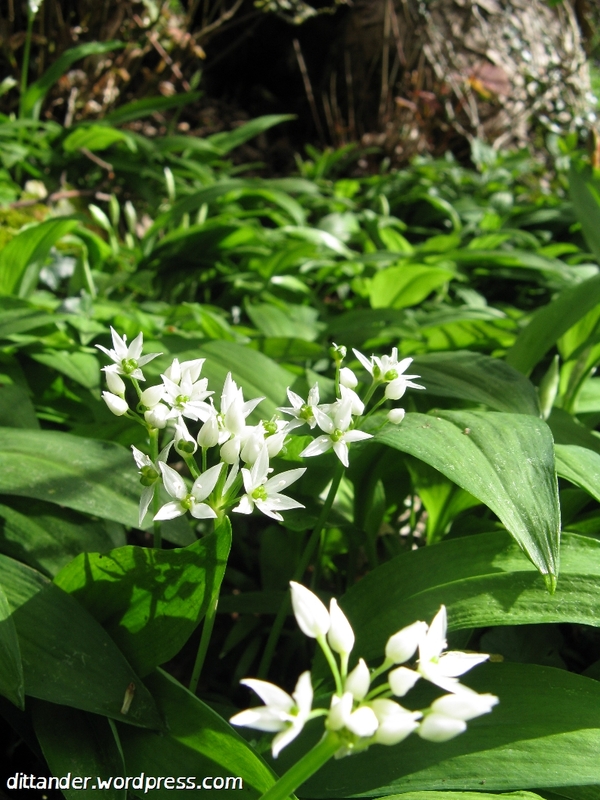 There are around 10 different types of garlic that grow natively in Britain, but ramsons are what most people think of when they hear the words ‘wild garlic’. This is because it is easily the most common and profilic Allium species, as well as having the largest leaves, making it more usable and versatile in the kitchen. It favours moist semi-shadey areas, growing mostly in and around woodland, but also along riverbanks. 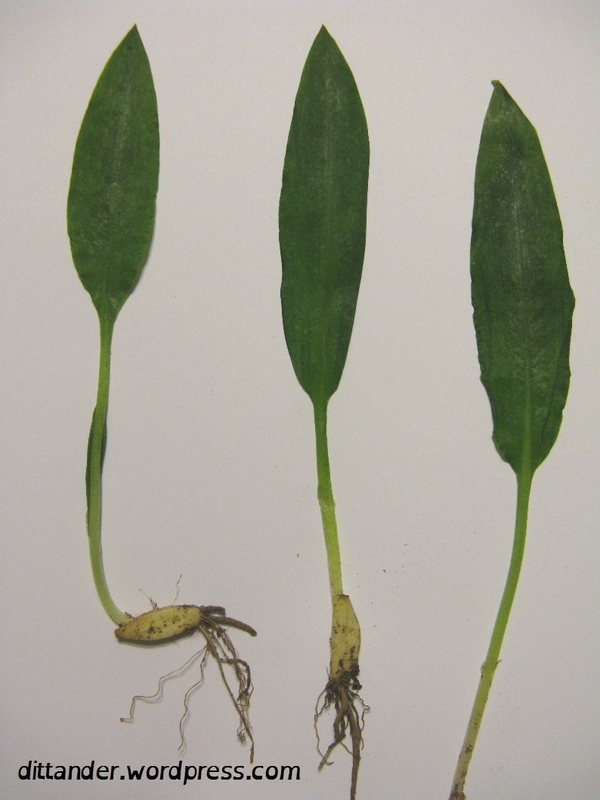 Ramsons are normally found growing in large colonies, often covering 100 square metres or more. Considering how abundant it is it is surprising that it is not used more than it is. The season only lasts a month or two, but the leaves can be preserved by making soup or pesto and freezing it. Also, both the bulbs and the seed pods can be pickled, as long as care is taken not to over harvest. Each bulb looks just the same as a clove from the garlic that you buy in the supermarket, but they are not protected by a skin so require some washing before use. The leaves are the easiest part of the plant to harvest – however they can be confused with other plants. Two of the most important potential lookalikes are Lily of the Valley (Convallaria majus) and Lords and Ladies (Arum maculatum). Lords and Ladies often grows in amongst ramsons so it can slip into a bag if you are not picking carefully. Both of these plants are highly poisonous, so it is important be fully familiarised with them before harvesting ramsons. However, neither of them smells of garlic so if you think you have found ramsons always crush a few leaves and smell them, as part of the wider identification process. Remember that after doing this your hands will smell of garlic – so don’t confuse the smell of your hands with the smell of a new leaf! Wash the ramsons and nettles. Cut the ramson stems into 1cm pieces and roughly chop the leaf. Chop the potatoes into cubes and fry in the butter until soft, along with the ramson stems and bay leaf. Then add the nettles, water and stock and cook for a few minutes until the nettles are soft. Add the ramson leaf. Depending on how strong you like the flavour to be you can take it off the heat straight away, or continue to cook for a few minutes. The longer you cook ramsons the less they taste of garlic. Blend the mixture and serve. Many recipes include an onion, but I find this unnecessary as ramsons have an onion like flavour when cooked anyway. I normally add some young nettle tops for their flavour and high nutritional value. The yoghurt or cream is optional, and can be mixed in or poured on top to serve. I also like to use ramson flowers to decorate the soup (if they are out). If you would like to learn more about finding wild food then come on one of my foraging courses in London. April 28, 2012 in Plants. mmm sounds delicious. Will try whilst there are still some leaves out! Thank you so much for this! I’ll surely be adding it to my soup rotation!